Dark matter, a mysterious form of matter that makes up about 80 percent of the mass of the universe, has evaded detection for decades. Although it doesn't interact with light, scientists believe it's there because of its influence on galaxies and galaxy clusters. It extends far beyond the reach of the furthest stars in galaxies, forming what scientists call a dark matter halo. While stars within the galaxy rotate in a neat, organized disk, these dark matter particles are like a swarm of bees, moving chaotically in random directions, which keeps them puffed up to balance the inward pull of gravity. Previous research led by postdoctoral fellow Eric Baxter; Bhuvnesh Jain, Walter H. and Leonore C. Annenberg Professor in the Natural Sciences in the Department of Physics and Astronomy in Penn's School of Arts and Sciences; and Chihway Chang of the University of Chicago provided evidence that dark matter halos around galaxy clusters have an edge due to the "splashback effect." 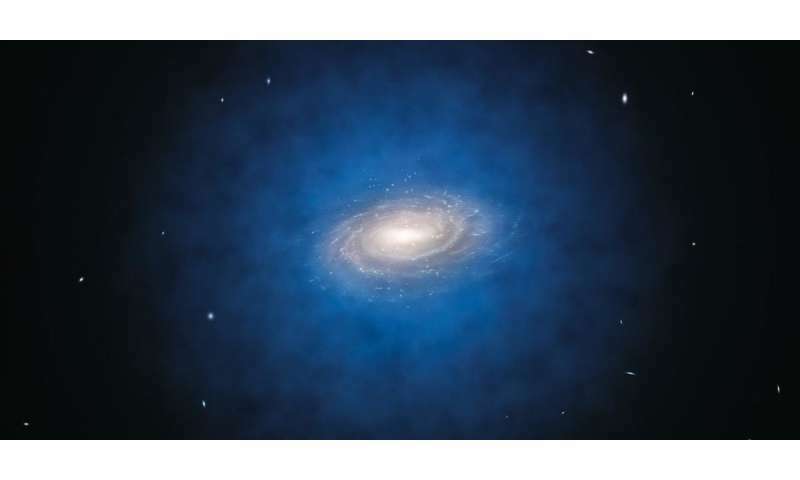 "You have this big dark matter halo that surrounds every galaxy cluster," Baxter said, "and it's been accreting matter gravitationally over its entire history. As that matter gets pulled in, it goes faster and faster. When it finally falls into the halo, it turns around and starts to orbit. That turnaround is what people have started calling splashback, because stuff is splashing back in some sense." As the matter "splashes back," it slows down. Because this effect is happening in many different directions, it leads to a buildup of matter right at the edge of the halo and a steep fall-off in the amount of matter right outside of that position. In their initial study, the researchers used data from the Sloan Digital Sky Survey to investigate the distribution of galaxies around clusters. In a follow up study using data from the first year of the Dark Energy Survey, the researchers used a different method called gravitational lensing, which takes advantage of a phenomenon in which light coming toward an observer bends as matter exerts gravitational force on it. By looking at the slight stretching of objects behind galaxies, the researchers can directly measure the mass profile, how mass is distributed within the galaxy. "There are many different applications of lensing," Jain said, "but this is one where something went from being undetectable to detectable, so it's particularly exciting." In a paper to be published in the Astrophysical Journal, the researchers showed that this method produced an understanding of the dark matter halos that is broadly consistent with what they saw using the light of the cluster galaxies in their first study. "We were pursuing this question of whether dark matter halos have a sharp boundary," Jain said. "The gold standard for establishing this is to look directly at the mass through gravitational lensing, which hasn't been done before now. With the latest compilation of DES data we see a picture very similar to what we saw in the distribution of galaxies." Measuring gravitational lensing is a lot harder than simply measuring the distribution of galaxies, Jain said. "We can see galaxies easily, we just take a picture of them," he said, "but with gravitational lensing we have to take pictures of many more faint, background galaxies and measure how those are distorted in tiny ways. It's a challenging measurement." This leaves more room for error in the measurements, causing them to be less precise. However, the findings were only based on the first year of observations of the Dark Energy Survey. By the end of the survey, there will be four additional years of data for the researchers to analyze. This will allow them to make more precise measurements, directly probing the matter in galaxies and galaxy clusters using gravitational lensing. Tests of dark matter will then be possible, since any new physical interactions between dark matter particles could shift the location of splashback. "We can look forward to a clearer picture of mysterious dark matter halos," Jain said. Comic relief for the way too lazy to get out of bed in the morning, Schneibo. Just keep in mind that we haven't yet proved the existence of dark matter nor dark energy. For now they just represent the best current theories. There is evidence of the smoothly distributed, strongly interacting, supersolid dark matter every time a double-slit experiment is performed, as it is the dark matter that waves. I don't know what this means. If you mean, galaxies don't spin like Rubin said and galaxy clusters don't orbit like Zwicky said, you are trivially wrong, simple as that. If you mean, the universe doesn't expand like supernova data, cosmic microwave background data, and large-scale structure say it does, again, you are trivially wrong. If you got some other terminology you want to use to explain all this evidence that says you're wrong, I don't see any reason it's better. If you think you got something better let's hear it. This is a bald statement "it's wrong" without any data to support it. Bring the data or expect to get pwnt. There are many people in scientific institutions who do not have their own personal opinion, but they are using others' statements. When they want to prove something, they say, it's said by that scientist whose claim has not been proven. How, you reasonable people believe in something that does not have any logical confirmation of the existence of it. Here I claim that all that you are discussing is nothing but the various relationships of the substance AETHER, which is filled with an infinite universe, with whatever character it has emerged. How to prove it? Science takes evidence as a combination of all the thoughts created under the command of the free will of individuals, and free will is the greatest obstacle to the development of consciousness, and consciousness is the unlimited power of understanding the phenomena in both the universe and within us. A consciousness is connected with the Absolute consciousness of the universe by means of intuition. All those who do not pay attention to it, their sesity has been suppressed. There is a law in the universe that does not allow the complex process to be solved freely. Scientists have created a computer and in it various programs and models and with these tools, they want to give rise to the appearance of something in nature from which everything is formed in both man and PC, but these "smart" experts, models and formulas and some stupid theories they take as their deities praying to prove to them what those experts have no idea. So they do not respect what nature has given them, but they believe the tools they have made themselves, that this "smart" tool obviously is what they have no idea about. PA, WHAT DO THESE TWO-SEPARATE ELEMENTS, WITHOUT A VERIFICATION? You are breaking the religion with the Absolute Awareness of the Universe (ACU) and with God, of which you know as much as the existence of Aether. To understand both the existence of both God and Aether, you must reject these tempting theories that everything is derived from nothing, and from these fatamorgans you invented some contaminating fabrications, that even illiterate people are wondering how science can be so dull. If you want to find out more about Aether, think deeply: how and from what "new subatomic particles" form in particles collide. " Is it logical and acceptable for normal people to get 600 of them in the collision of two protons? If so, then ask those Easter experts to fight eggs with them, and 600 eggs will appear, two of them broken! I know and argue that in these "empty" pipes there is an Aether from which particles are formed that are not constant, and are obtained by increasing the speed of the particle and the magnetic field. Second, do you know how to explain why a magnetic field occurs around the conductor through which the current flows? How does that show up? Or, who is the one who instincts the electrons to move through the conductor, if that conductor cuts through the magnets? Especially, how are these forces formed, and who is the one who forms them and how? You do not know it, it was not anyone who was from science !! Tesla, my compatriot, knew about Aether and therefore made such progress in the field of electromagnetism. And as far as God is concerned, he knows what each of us is doing and thoughts, and therefore there is no need and make fun with it. The one who does not know the structure of the universe and who does not respect the existence of his Creator, which is the SEU, has nothing to do with the foundations of religion. Nuke is totally embarrassed when he is struggling to create himself a third entity in the universe, which does not respect the SEU. This, if God is mentioned, you all jump as fools to show that this is the realm of religions. This is evidence that you entered the zone of "dark activity" as you believe in dark matter. Who correctly understands God, this is not religious, but a true believer, because he believes in truth, and the truth is what our individual consciousness represents to us, which through intuition establishes a connection with SEU and ACU. The Spirit of the Universe (SEU) forms everything from Aether, and it is just a component of the MEEU, both in us and in the universe, and the SEU is the manager of everything in the MEEU. Once you understand this, you will understand Aether and matter and magnetism and gravity and you will no longer believe in the stupid theories of Einstein and his fans. I am also for science, but the one that develops towards the understanding of the structure of the universe, in which we, human beings, are the last patent of SEU. Whoever does not accept that, there is no spark of the SEU in itself, and that is the soul, and him, his free will, the water through a part of the universe, as a man leads a little dog with him, his beloved, whom he loves because the dog respects him, and it is known why.